HILT participants are invited to attend special experiences in the city of Indianapolis. Organized with our attendees and their interests in mind, taking part in these experience offers an opportunity to befriend fellow HILT participants outside of your classroom. Join architectural archivist Jordan Ryan for a brief walking tour of significant downtown Indianapolis architecture, including historic buildings designed by Rubush & Hunter, mid-century Modern and Brutalist structures, and more recent urban revitalization projects. Tour will leave from campus and be roughly 3 miles of walking. 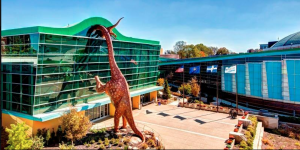 The Children’s Museum of Indianapolis is an award-winning museum located here in Indianapolis. HILT attendees will receive a tour of the museum’s collection that contains over 130,000 artifacts and specimens in the Arts & Humanities and Natural Sciences. You’ll learn about the digital strategies the museum uses including the recently-released Ryan White Letters project. This tour will be Friday, June 7th from 10 am to noon. The museum is accessible to our attendees with physical, auditory, and visual concerns. Our tour includes free parking and free admission to the Museum only for registered HILT experience attendees. You can register through the HILT registration portal. Please note: HILT will not provide transportation to the museum.